This is a very large and heavy knife. If you're thinking it might be too burdensome to wield, or be too much extra weight on your hip, just get a smaller utility knife and keep the survival basics in your pack. 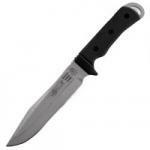 SOG's original, full-size Pentagon knife earned its name for being a leading military and law enforcement tool. Later on, SOG introduced the Mini Pentagon. It's smaller in size, but equivalent in every other aspect to its front-runner namesake. One thing's for sure: The Apache Dawn is an investment. But for the money you'll spend, you'll be getting an incredibly durable, well-crafted tool that should serve you for multiple uses throughout your entire lifetime. Actually, no. This bushcraft knife from Frosts Mora (aka Mora of Sweden) has everything you need in a survival knife and it doesn't cost an arm and a leg. Ontario Knife has gained a reputation for making top-notch military and tactical knives. 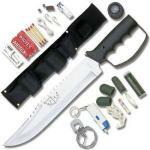 Their RAT-3 knife meets all of our requirements for a good survival knife. Looks can be deceiving. At first glance, looks like there's nothing special about this knife. What sets it apart from the rest? For one thing, it's got a textured Thermorun handle that's lightweight, rock-hard, protective, and weatherproof. 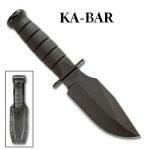 This sturdy knife by Ka-Bar is made for many purposes. One of the first noticeable features of the Ka-Bar Warthog is its unique shape, which contains cutting surfaces on both the front and back side of the blade for multi-purpose use. 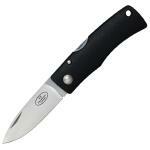 This Western knife is manufactured with a 2-3/4 inch fixed, hollow ground clip blade. Made of high quality carbon stainless steel, this full-tang blade is designed especially for small game. It is structured to last and remain sharp for a long time. 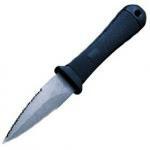 Schrade has always been known for providing high-quality knives at reasonable prices. This knife is a great example of that. 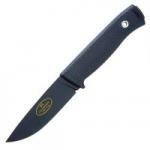 Schrade has found a way to offer its customers durability in the classic Western style when they decided to manufacture this old time Deerslayer Sharpfinger knife. 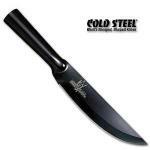 This is a unique knife from Cold Steel -- it's pretty inexpensive, is made from high-quality materials and has no seam. It has no joint or seam because it's made from a single piece of SK-5 high-carbon steel. It is heat tempered and treated up to RC54. The Model #14 Attack and the #15 Airman are so similar, they almost don't deserve their own model numbers. The only real difference is the blade length. This is the one that started it all. In World Ward II, the popularity of Randall Made Knives too off, due to the popularity of this model among American GIs. I won't go into much detail on the Randall Made Knife company here. You can find that in our review of the Model 17, the Model 18 or in this comprehensive book. Now seventy years in production, Randall Made Knives have always had a reputation for quality. During WWII, they gained quite a bit of notoriety as several well-known soldiers carried and endorsed them. Ronald Reagan, for example, owned a Randall during WWII.